Hepatitis – B is the ninth leading cause of death worldwide and one of every three person is infected with Hepatitis – B, said the speaker at a seminar. Department of Public Health of Daffodil International University in collaboration with Ibne Sina Trust jointly organized the seminar on “Hepatitis –B & Cervical Cancer Vaccination” on July 16, 2012 at DIU Auditorium. Prof. Dr. M. Lutfar Rahman, Vice Chancellor, Daffodil International University was present in the seminar as the chief guest while Prof. Dr. Aminul Islam, Founder Vice Chancellor and Emeritus Professor of Daffodil International University was present as special guests. Prof. Dr. Shah Md. 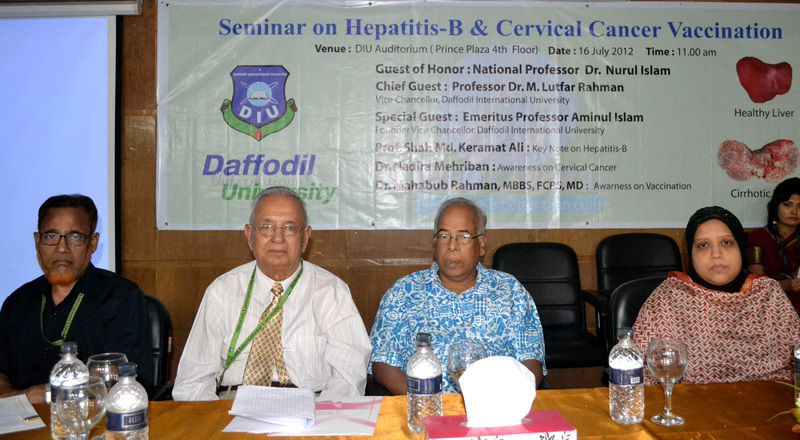 Keramat Ali, Head, Department of Public Health of Daffodil International University presided over the seminar. The keynote paper on Hepatitis – B was presented by Dr. Mahabub Rahman, Consultant, Ibne Sina Trust and keynote paper on Cervical Cancer Vaccination was presented by Dr. Nadira Mehriban, Associate Professor of Dept. of Public Health of Daffodil International University. Conducted by Ms. Mehbuba Khanam the seminar was also addressed by Prof. Dr. Formuzul Haque, Head, Department of Nutrition and Food Engineering and Syed Mizanur Rahman Raju Coordinator, Career Development Center(CDC). The speakers informed the seminar that around 400 million people of are the long term career of Hepatitis –B, among them around one million people die from Liver Cirrhosis and Liver Cancer caused by Hepatitis –B. They also informed that on an average every day 2800 people die diseases caused by Hepatitis –B. Addressing as the chief guest Vice Chancellor Prof. Dr. M. Lutfar Rahman, said, Daffodil International University is very much conscious about the health care of the students and for that university authority already set up a medical center. After the commencement of Department of Public Health, a series of Health concerned awareness program, seminar and workshops have been organized under the department. He urged the students to follow the rules of health in every step of life which help them to be healthy and to contribute to the nation.